For the last couple of years, the G Pro line has been LG's answer to Samsung's Galaxy Note phablets. Unlike Samsung's Notes, however, LG's G Pro phones just didn't seem to strike a chord with consumers who were on the lookout for a super-sized smartphone. Perhaps, it was the lack of any major distinguishing features that prevented the G Pro from being noticed by the wider audience. Maybe, simply having an extra-large display was no longer enough to secure the win in the phablet category. Maybe, LG needed to come up with its own S-Pen-kind-of-feature that would make its device stand out from the hordes of Note-wannabes. You know what? It might have come up with just that. While initially it might appear to be just another experimental device from LG, the new V10 jumbo smartphone might very well take the place of the uninspiring G Pro line for good. Here's the deal: the LG V10 may have just a marginally larger screen than that of the LG G4, but it comes with a unique trick of its own: a secondary display that's always on to show you the time and date, notifications, or next calendar event. 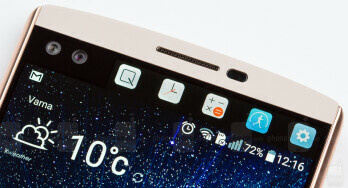 Could this be the special ingredient to make phablets work for LG? Note: We're reviewing the South Korean model of the LG V10. It's basically identical to the global one, though some minor aspects of the experience might vary from region to region. The V10's rear power key now doubles as a fingerprint sensor. The LG V10 feels like a very different smartphone from the G4. While LG's top device is gently curved, compact and soft (especially if it's outfitted with any of the leather back options), the V10 is flat, large and sturdy. 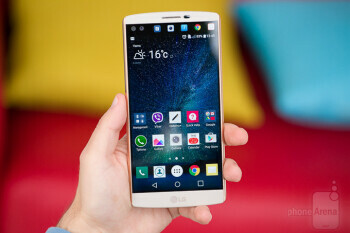 This is, unmistakably, the phablet in LG's line-up. It bears some of the company's typical design characteristics, like the minimal top and bottom bezels, as well as the power and volume buttons situated on the rear, but it's by no means a larger version of the G4. The V10's exterior design is a mixed bag. It's thoughtfully shaped, good-looking even, but the materials and colors that finish off the package are rather bland. Worst is the back side, which looks and feels surprisingly rough. After the delicate, sophisticated leather designs that LG introduced with the G4, it's strange to see it revert to a cheapo, rubbery plastic for the V10. The available color variants also fail to hit the right notes, not least because they are boring. But the shape of the _phone_ is appealing, while the unique stainless steel bars on the flanks add a much-needed element of elegance to the body. They are a really cool idea, because 1) they look good and different from what's out there, and 2) they aren't as slippery as the rest of the phone, due to their smooth, glossy finish. The V10 has a well-balanced appearance, but sadly, the same cannot be said about its weight, as this overly large _phone_ ultimately comes off as a bit top-heavy. It's not the most comfortable handset to hold and work with, but it's tolerable. LG is staying true to its 'rear keys' concept, and that's OK, because getting used to their offbeat positioning isn't so difficult. What we can't get used to, however, is the unpleasant wobbliness of the power/lock key, which doesn't feel particularly well crafted. The good news is that it now doubles as a fingerprint scanner, which works well. There's the odd failed reading attempt at times, but the success rate is still high enough. The LG V10's secondary display is a neat idea that needs better execution. Equipped with a 5.7” panel, the V10 is undoubtedly for the fans of extra-large screens. Resolution is extremely high, at 1440 x 2560 pixels, which tastes like an overkill even for this screen size, but we'd rather not take part in them specs wars. Bottom line is that legibility is great. The IPS LCD screen LG has used looks good, but is too contrasty – it doesn't appear all that natural. The same goes for the color balance: it suffers from a desperate need of red, but this is a need we know will never be fulfilled, so the V10's screen will remain as it is for the remaining time of its lifespan: cold and blue. By itself, it doesn't necessarily come off as lifeless, but once you compare it against a quality screen that has even the faintest respect for colors, you'll immediately notice its disadvantage. Check out the measurements we've done in the chart below: the high color temperature, high gamma, and high delta E values all corroborate our observations. But it's not all bad: outside visibility is good enough, while reading in the dark won't destroy your vision, thanks to the satisfying minimum brightness level. Up to this point, everything sounded fairly ordinary. This is where it gets interesting. Now, LG has one in the V10 as well: a secondary screen! It's a short LCD panel strip that's fitted right above the main display. Yeah, right next to the duo of selfie cameras... If this is getting a bit weird, don't worry – there's nothing too complex to wrap your head around here. It's all fairly simple, actually. 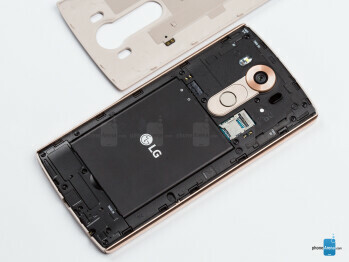 Apparently, the 5.7” display of the V10 does not provide enough screen space for LG's software designers to fit everything they want, so a second panel is in order. Users who aren't into the idea of it can turn it off, because it provides only auxiliary functions, but why would you buy a V10 if you're going to avoid its standout feature? Anyway, the small, second display is always-on. When the phone is sleeping, the second display continues to work, displaying the time and date, as well as any notifications that may arrive. It's a fun, useful concept, but also one that feels severely compromised. The second display is LCD, meaning there's a back-light that's always working to make it visible. This tends to consume more power than an OLED display used in the same manner, because OLED displays can light up only certain pixels, leaving the rest completely off, saving power. Because of this, LG is keeping the back-light of the second LCD screen relatively low, because it's not supposed to waste too much battery power. The end-result is this: when the phone is in sleep, the secondary display is so dim, it's hardly visible with the phone lying on a table, not least because LCD screens lose brightness and contrast when looked from an angle, unlike OLEDs, which experience color shifts, but stay bright and easily visible. So, LG's decision to use an LCD panel for the secondary screen is perplexing, to say the least. It also makes for an awkward appearance in the dark, when the dedicated and not so even back-light becomes evident. It's not a big issue, but one that takes away from the V10's already limited stock of “elegance” points. LG's software lets you tweak almost everything, but its default state isn't particularly smart. The LG-made Android 5.1 software running on the V10 is incredibly flexible, customizable, versatile, powerful even. In short, it's a mess. Our point is, the default state of a big chunk of the LG V10's software isn't particularly smart, or tasteful. The portrait keyboard is tolerable, but the landscape keyboard's design and positioning are terrible. The list of keyboard settings is like an endless labyrinth – they never end! Sooner or later, you'll want to just hit the home button and escape from the horror of it. At least it has a Swype-type input built in, which works well. Once you set your email account up in the Email application, it defaults to manual refresh. After a few missed messages, we felt something wasn't right, thus finding out this weird default setting. And don't get us started on the design of the Email app itself – it's mind-bogglingly amateurish, lacking simply formatting touches to make browsing through the list of messages easier, let alone pleasant. What's even worse is that you can't adjust server directories – something that you DO want to have a setting for. For people who's work duties involve regular email usage, this client is no good. There are other nuisances we can talk about, like the extremely poor choice of wallpapers the LG V10 offers, but we'd rather not. The main takeaway, as far as LG's software experience goes, is that more often than not, you can get it to act well enough, but it'll take time and effort on the user's side, which isn't a price we're looking to pay. This doesn't necessarily apply to the way the secondary screen functions. Most of the time, it gets its job done pretty well without requiring too much input from the user. It is designed to complement whatever is on screen with extra functionality or quick shortcuts to various other features, which is cool. You can hold a bunch of things there, like some of your favorite contacts, or favorite apps, or next calendar event, but our favorite function is the recent apps pane. With it, it's like you constantly have an app switcher on hand – it'll be very practical for heavy users. During the time we spent with the V10, found the secondary display to be a handy little tool. However, we aren't sure if the added functionality warrants the need for an additional display. 5.7 inches are a lot of screen space, maybe LG should have worked on utilizing it in a smarter way with its software, rather than put a second screen. At the very least, apps like QMemo+ (that's the notes app, by the way), don't need to use such gigantic font sizes, especially on a 5.7” QHD display. Seriously, with the on-screen keyboard drawn out, you can see just a few lines of text – considerably less than what you see in the iPhone's Notes app, where the screen is smaller, and the resolution is lower. And don't even think about working with notes in landscape – you'll be left with 2-3 lines of gigantic text on the screen. It's pretty bad design. 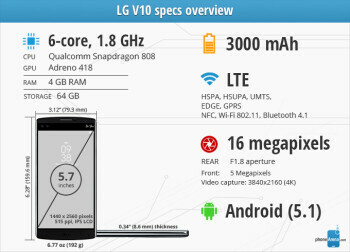 LG's fastest smartphone to date. The LG V10 is a high-end smartphone, but the chipset powering it is not the strongest one around. Same as on the G4, it's the Qualcomm Snapdragon 808 – a six-core CPU configuration that strikes a good balance between performance and efficiency. The weak element here is the Adreno 418 GPU, which has traditionally provided decent, but not great results. First, before most, though, we're concerned with the system interface performance, and here, we want to congratulate LG for the huge improvement over the G4. Granted that the hardware is the same on both, it has to be the software that LG has worked to optimize, and the result is commendable. The LG V10 impresses with very fast response times and minimal lag, which makes it one of the fastest Android phones around. There's the occasional delay, but those seem to be few and far between, so they don't hamper the experience at all. In that sense, using the V10 is a pleasure. Had LG been more level-headed and gone with 1080 x 1920, we can imagine that 3D games would have performed pretty well too, but at 1440 x 2560, the Adreno 418 GPU is starting to show its limitations. Not that anything's unplayable, it's just that frame rates could have been considerably better in more demanding titles like the new Order & Chaos 2, or Angry Birds 2. When it comes to popular apps, such as Facebook, YouTube, or Viber, the V10 doesn't leave you wanting for performance. But the shape of the phone is appealing, while the unique stainless steel bars on the flanks add a much-needed element of elegance to the body. They are a really cool idea, because 1) they look good and different from what's out there, and 2) they aren't as slippery as the rest of the phone, due to their smooth, glossy finish. The V10 has a well-balanced appearance, but sadly, the same cannot be said about its weight, as this overly large phone ultimately comes off as a bit top-heavy. It's not the most comfortable handset to hold and work with, but it's tolerable. 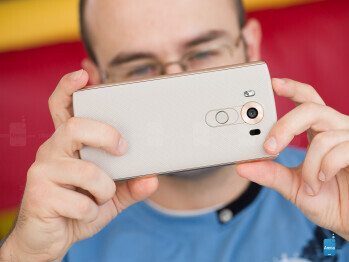 LG delivers yet another awesome camera, but video recording leaves something to be desired. The LG G4 had a phenomenal camera that could easily go toe to toe with the best of Samsung or Apple. 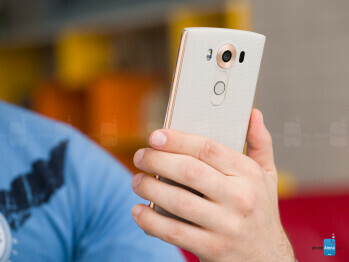 Equipped with a sensor of the same, 16 MP resolution, we expected the LG V10 to perform in a similarly great manner. It did not disappoint. Credit where credit is due: the camera app, which is very rich in settings, is a great place to experiment with different kinds of photographic settings. Its manual mode gives you the freedom to tweak a variety of things, like the ISO, shutter speed, or white balance. Given the rest of the UI, the camera app surprises with its intuitiveness and ease of use. Settings appear to be arranged in a logical and accessible manner, which is great if you often feel like tweaking things and not fully trusting the Auto mode to figure out everything on its own. And while that's great, what isn't is that the camera app often happens to become unresponsive, rendering the touchscreen (and thus, the whole phone) useless. When it gets stuck, the only solution we found was to wait for, like, 5 minutes for it to get back to normal. When you're stuck helplessly waiting for your phone to become usable again, 5 minutes feels like a lot of time. This happened three times in the course of a 30-minute shooting session, which makes us question the reliability of this camera app. Thankfully, we haven't noticed similar instability issues with the rest of the phone's software. 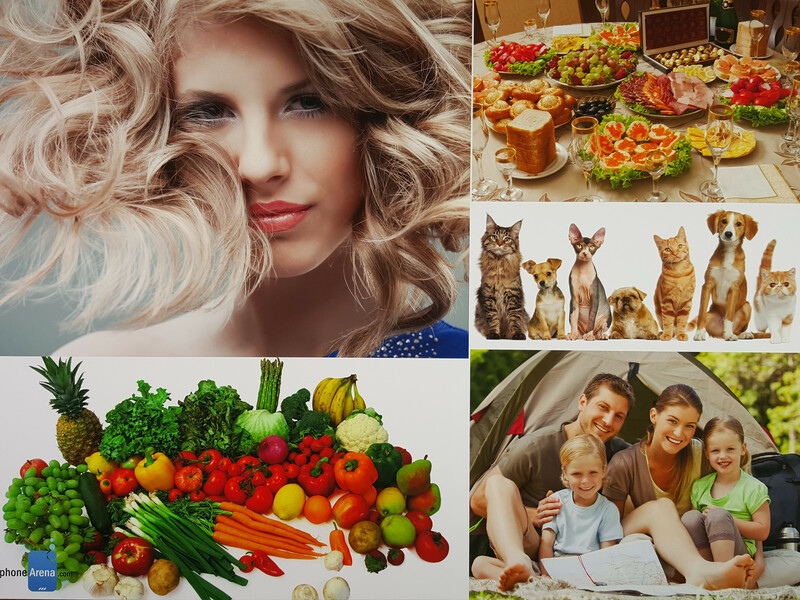 Still images taken with the V10 come out very realistic, with accurate white balance and good exposure levels. You also need to try really hard to come up with a blurred photo – the V10 does a great job as far as still image focus and sharpness go. We did a quick 1v1 “careless hands” shooting session between the V10 and G4, and some of the G4's photos came out unclear, while those of the V10 remained stubbornly sharp. It's safe to say that at the present time, the V10 can produce one of the best photographs one can take with a smartphone. It's a very capable camera. Taking pictures in dimmer, indoor environments, increases the risk of ending up with a slightly hazy shot, as can be seen in the photo taken at the cafe, but with some careful positioning, this problem should be easy to avoid. Meanwhile, the front-facing cameras are glorious, producing deep, colorful, nicely detailed portraits. Watch out for the “beautify” effect though, as it is engaged by default. 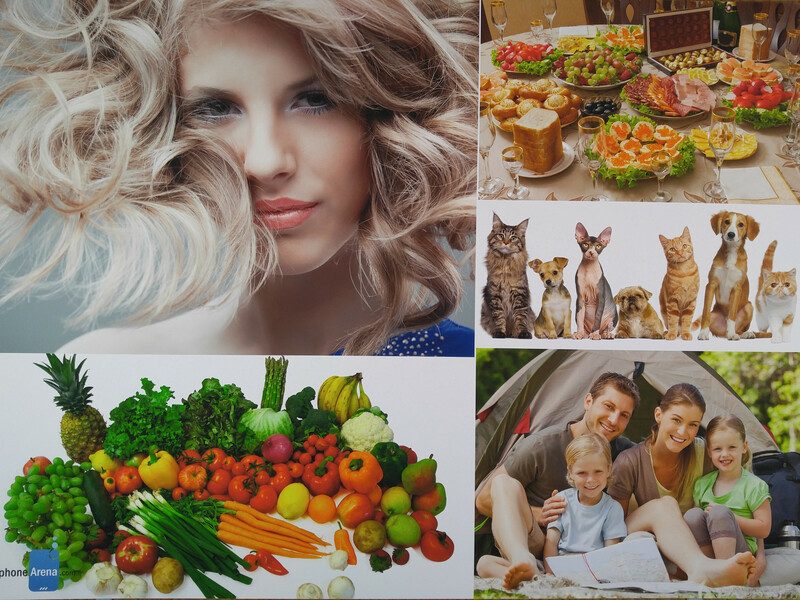 When used in large quantities, it can lead to distasteful results. There are two front-facing cameras: one that's used for near-field, single-person selfies, and another that has a wider lens for taking group selfies. It's a peculiar solution by LG, but it does work. One of the stand-out features of the LG V10 is the manual video recording mode. It's handled similarly to the still image manual mode: a similarly laid-out interface gives you access to a number of settings to change, such as white balance, focus, ISO, and shutter speed. Overall video quality is decent, but nothing impressive. 1920 x 1080 footage recorded with OIS suffers from severe jello effect, which is very prominent when there's camera movement. This issue isn't present when recording with the Steady mode engaged, which uses OIS and software stabilization in tandem. It cuts a bit of the image's outer region out, but definitely yields better results. Either way, detail level isn't too good, and there's a certain amount of graininess to the footage. Color balance turned out a bit on the colder side in the videos we recorded. The V10 allows you to record at 4K video resolution. In this mode, detail level is much better, but colors stay somewhat off, while the jello effect is once again noticeable, along with frequent auto-focus adjustments that make the video a bit hard to look at. LG was promising that the V10 will do for video what the “G4 did for photographs”, but while the G4 is indeed a great phone to take pictures with, the V10's video recording capabilities leave something to be desired. Decent performance, but there's a lot of room for improvement. 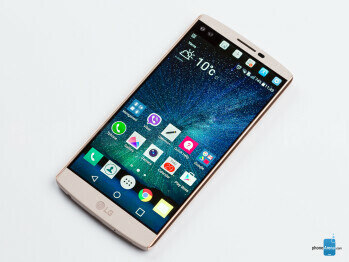 LG is positioning the V10 as heavy-duty multimedia device. It's supposed to be great for not only recording, but watching video as well. We already saw that the camcorder isn't the best it could be, so what about the watching part? Well, as far as the diagonal goes, you can hardly go wrong with such a massive, 5.7” display for video playback. However, the V10's screen requires that you don't care too much about color balance, because otherwise, you may end up being put off by the bluish tint. On a positive note, it's a plus that the V10 can play a plethora of video and audio formats out of the box, including lossless audio in WAV and FLAC formats. This brings us to one of the LG V10's selling points – the 32-bit Hi-Fi DAC. This is a fancy feature that probably doesn't ring any bells. That's because high-resolution music with 32-bit depth is next to impossible to find. No music record sold offline or online comes at such bit depth, and that includes iTunes, Google Play Music, Apple Music, Spotify, or even the one streaming service that's famous for its lossless content: Tidal. The latter is indeed streaming lossless audio, but that really means 16-bit, 44.1 kHz music, so the 32-bit DAC of the V10 won't make any difference there as well. All music CDs (not MP3 ones, but actual audio CDs), which have lossless quality, also come with 16-bit depth – this is the de facto standard. If you don't happen to be an extreme audiophile, who has somehow managed to build a collection of high-res, 32-bit audio, you don't really need to bother your mind with this feature. Still, the audio chip inside the V10 remains a quality one, which is good to have even if we're going to be using it mostly for standard, compressed audio (which is most audio out there). The loudspeaker is pretty decent. It's strong and doesn't sound too bad. It could use a bit of brilliance in the high frequency range, but all in all, it's good. The Quad Beat 3 earphones that come with the LG V10 are also satisfying. At first, they may sound rather shallow, but once you stick them real tight into your ears (admittedly, not the most pleasant of sensations), they show their good side, with a tight punch and balanced, likable audio reproduction. Quick to charge, quick to discharge. When it comes to battery life, the LG V10 tends to be an average performer. It's equipped with a 3000 mAh battery, same as the Samsung Galaxy Note 5, but doesn't impress much. It can easily handle a day an a half of medium usage, but don't expect wonders from it. Our battery test corroborates our battery life observations – the V10 was fully discharged after the unimpressive 5 hours and 51 minutes. The Snapdragon 808 chipset has proven to be efficient enough, but we feel screen-on time is drawing quite a bit of power from the battery. However, the V10 does have one big advantage in this department: the battery is removable. This gives you the option to purchase an additional battery unit and swap out the depleted one when need be. Even if you don't go the spare battery route, the V10 won't be out of the game for too long. It is super-quick to charge its battery! Using the stock charger, the juice pack went from 0 to 100% in the astonishing 65 minutes, which is the second-fastest charging time we've measured, only slightly behind the Asus ZenFone 2 and its equally big, 3000 mAh battery, which was ready for action in just 58 minutes. The 65-minute charging time of the LG V10 is faster than the already fast 81 minutes of the Galaxy Note5 (3000 mAh), or the 89 minutes of the Nexus 6P (3450 mAh). In comparison, Apple's iPhone 6s Plus charges with the speed of an elderly sloth, requiring 165 minutes on the stock charger – 2.5 times slower than the V10. 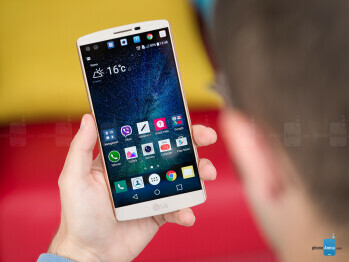 The battle for the phablet crown continues. Samsung and Apple have already secured the largest chunks of the market to them, but LG seems committed to becoming a major force in the extra-large segment as well. The G Pro didn't quite work out as planned, but the V10 is a new beginning for the company's ambitions. It's loaded with features, it literally doubles the screen and the front-facing camera; it has it all, even an IR blaster, replaceable battery and microSD slot – features its rival, Samsung, recently left behind. 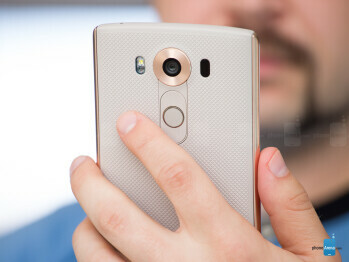 Unlike Samsung, however, LG seems to be firmly confident that more is most certainly better. And for some people, it most certainly is. There are undeniable benefits in having a specs sheet as lengthy as the household chores list your partner unexpectedly hands you on a Saturday morning, but the question we should always keep asking is this: are all of these features integrated wisely, or are they confusing, compromising the experience? Furthermore, do they work as advertised? To these questions, the answer is rarely a firm yes with the V10. There are certain areas where it excels, such as performance and still image quality, but it tends to falter in others, like display quality, video recording, and general user experience seamlessness: the unstable camera app, inaccurate auto-brightness function and inefficient app design are just some of the issues we encountered. 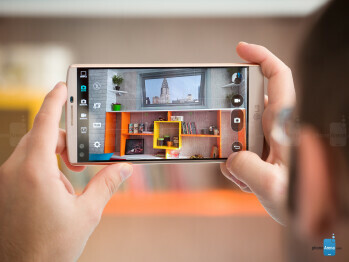 With the LG V10, it's more show than substance. It's suitable for techies, but not so much for consumers who want it to just work.